This beautiful vase / mug is approximately 8" tall and 10" deep x 3" wide. The opening is 3" diameter, perfect for drinking or planting. The weight is 4 pounds. It has a chemically applied three tone patina that is beautifully antique in appearance. The quality is Exceptional. It was made for the movie "Alexander" with Colin Farrell, Angelina Jolie and Anthony Hopkins. We were able to acquire several great pieces made for this movie. This rare piece is very graceful and a pleasure to view. These are movie props we supplied the movie "Alexander"
1-800-321-8618 to pay by credit card. All payment options are accepted including Paypal. Domestic shipping is FREE for additional items if they can be shipped together ! What gives bronze art value beyond that of a "souvenir" that ends up in a closet? There are many reasons including cost of materials (bronze, silicone for molds, tools, ovens, etc.) The main reason is that there are very few people trained in the tedious process, practiced by the ancient Greeks and Romans. All bronze pieces are cast from a wax model regardless of the original material the model was sculpted. A silicone mold is made from the artist's finished piece, and a hollow wax cast is drawn from this mold. The wax is then repaired, re-worked and finished to the sculptor's specifications. Prior to creating a ceramic shell (explained below), vents are attached within the wax model. These vents are necessary in difficult areas where gas may accumulate such as hips, limbs, and neck. The vents allow the gas to escape when the molten bronze is poured and will prevent air pockets from forming and exploding the ceramic shell. The ceramic shell is one of the few materials the can withstand the heat of the molten metal. When the wax cast is hardened and the vents are in place a ceramic shell is formed over the wax. This shell is made by dipping the wax into a slurry, coating it with sand, drying and repeating the process up to 14 times. A core consisting of plaster, ground brick and water is poured into the interior of the wax mold. After the ceramic shell and core have set, the mold is fired in an oven, the wax is melted and the ceramic shell is left intact. This process is known in French as "cire perdue" (lost wax). Molten bronze is now poured into the cavity left by the melted wax. When the bronze is cooled, the shell is chipped away using a hammer and chisel. The bronze must now be repaired and finished. This step is called "chasing" and it is a difficult process because the metal is involved. Any imperfection such as air pockets of pits must be brazed with bronze rod, as in welding. All seams and spurs must be removed by grinding, rasping and, finally, sanding. The next step is to chase or hammer the vents from the mold using special tools. The natural bronze has a dull finish. after final finishing, a patina is applied which may be left matte of polished. Chemicals, pigments, heat, safety equipment and a lot of experience are involved. 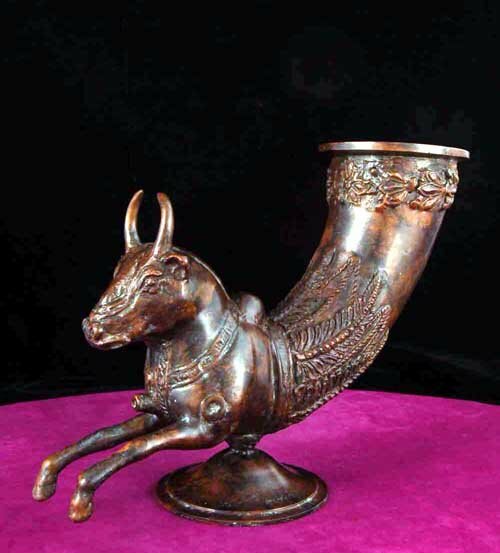 In addition, since bronze comes in a variety of alloys, the patina requires different chemicals and techniques. When shopping for bronze art work, beware of terms such as "cold cast" or "bonded bronze." These are misleading names given to plastic figurines. If you are unsure of the authenticity of an item that you see elsewhere, feel free to call us at 1-800-321-8618 for an honest and professional opinion.